With a readership in the millions, The New York Times routinely influences public debate on a host of issues through its news coverage. Can a small news outlet of perhaps 50,000 circulation do the same thing? The answer, says Albert J. Weatherhead III University Professor Gary King, is that in an age that relies on internet publication and social-media dispersal, even small- to medium-size media outlets can have a dramatic impact on the content and partisan balance of the national conversation about major public-policy issues. In the first large-scale, randomized media experiment of its kind, King and former students Benjamin Schneer, now an assistant professor at Florida State University, and Ariel White, now an assistant professor at Massachusetts Institute of Technology, found that if just three outlets wrote about a major national policy topic — such as jobs, the environment, or immigration — discussion of that topic across social media rose by more than 62 percent, and the balance of opinion in the national conversation could be swayed by several percentage points. Those findings, King said, are the result of more than five years of work, much of it spent convincing 48 news outlets to agree to take part in the study. About half of these outlets were represented by the Media Consortium, a network of independent news outlets that was eager to find a way to measure impact and was willing to help. Though similar efforts have been tried in the past, they invariably collapsed as journalists chafed at the idea of being told what to report and when to report it. To address the problem, previous researchers fell back on clever tricks, such as studying areas that fell outside the broadcast area of a particular outlet but, because no one knew whether the areas were truly random, were hard to evaluate. Such studies faced many problems, particularly their inability to control for a host of factors such as race, education, or income. 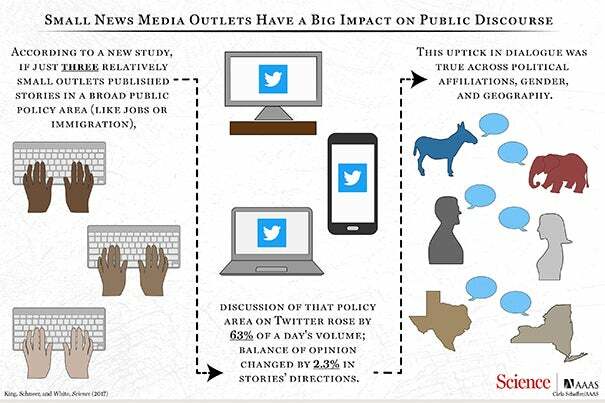 It wasn’t only the participation of news outlets that made the study noteworthy, though. “If you’re doing something like a medical experiment, you may randomly assign individual people to one of two groups, and then each person is your unit of analysis,” he said. “But when a media outlet publishes something — no matter how small — the potential audience it could impact includes basically everybody in the country. That means our unit of analysis can’t be a person. It has to be the entire country, which greatly increases the cost of the study.” That means that the equivalent of an entire experiment in many other studies constitutes only one observation in this study. Because collecting each observation was so expensive and logistically challenging, King and colleagues used, and further developed, novel statistical techniques to enable them to collect only as much data as needed. After each massive national experiment they could then examine whether they had amassed enough data to draw reliable conclusions. To achieve the randomization needed for the study, King’s team, the Media Consortium staff, and journalists at the 48 outlets identified 11 broad policy areas. They then simulated the tendency of journalists to influence each other and publish stories on similar topics, sometimes called “pack journalism,” by choosing three or four outlets from their participating group of 48 to develop stories together that fell into the same broad policy area. What they found, King said, was that the effect was larger than anticipated. “The actual effect is really big,” King said. “If three outlets (with an average circulation of about 50,000) get together and write stories, the size of the national conversation in that policy area increases a lot. It’s a 62 percent increase on the first day’s volume distributed over the week, just from these three little outlets. This research was supported with funding from Voqal and Harvard’s Institute for Quantitative Social Science. Though people are likelier to make an uninhibited post on a temporary social media platform such as Snapchat, viewers are no less likely to harshly judge them for it, according to a study by Business School Professor Leslie John.